Recently, I attended a dégustation de chocolat (chocolate tasting) at Un Dimanche à Paris on the historic cobblestoned Cour du Commerce Saint André in Paris’s 6th arrondissement. What on earth is a chocolate tasting, you ask? Well, that is what I went to find out. I have been to a number of wine tastings, and even a champagne tasting. But a chocolate tasting? Certainly, I have no objections to the concept. But nonetheless, I was skeptical 1) that there were such intricate nuances in the different varieties of chocolate that could lend themselves to dissection in the same way as with wine, 2) that my taste buds would really be able to discern these soupçons, and 3) that even if I were proved wrong on numbers 1 and 2, that I could see such an exercise as anything but the most pretentious bourgeois waste of an evening anyone could imagine. Un Dimanche à Paris is an imaginative multi-function space that opened about a year and a half ago. 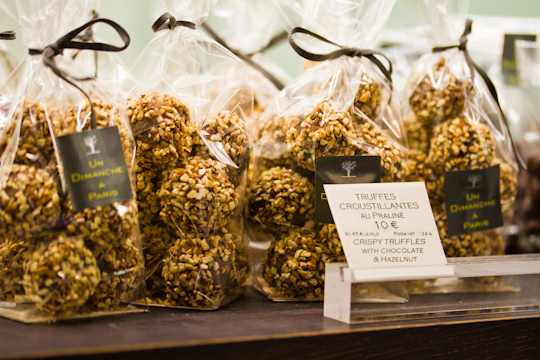 Downstairs is a chocolate boutique and a restaurant, serving dishes with hints of chocolate. And yes, you guessed it – they serve up a gourmet brunch on Sundays. Upstairs is a lounge (open daily until midnight) and a large “eat-in” kitchen for private tastings. Un Dimanche à Paris also offers cooking classes. Our tasting with Pierre Cluizel started with a brief overview of the chocolate industry. M. Cluizel explained how the chocolate is harvested, extracted and then processed, and he described the various players in the game. I found this to be quite interesting, as I previously knew nothing about how chocolate is produced at the early stages. I ate my first unadulterated chocolate bean. It has a bitter, dry taste resembling only remotely the chocolate we all know and love. But I still loved the idea of cracking a real chocolate bean between my teeth. The actual tasting consisted of three “varietals” – a small chocolate square from the Dominican Republic, one from Ecuador and one from Madagascar. Then we had a “mystery” nibble and we had to make an educated guess as to which of the three countries our final piece came from based on the “tasting notes” we had uncovered from our earlier deliberate chewing. The “tasting notes” is where they sort of lost me. Whether a wine has a citrus flavor or a blackberry flavor, an earthy undertone or tastes like bananas – I can appreciate the idea that there are generally agreed upon descriptive for classifying the impression wine makes on your taste buds, even if I cannot always detect and rarely can identify these tones myself. It is then logical that chocolate, which also originates from a particular terroir or piece of earth, would have similar distinguishable qualities. But I am still having trouble understanding what one might do with this knowledge if one is not planning a career as a chocolatier. You might walk into a wine shop and ask for something round with a taste of berries, but would you really walk into a chocolate shop and ask for a bar with a flowery undercurrent? As the tasting notes discussion wore on, I found it hard to keep from laughing… I guess I’m just not that sophisticated. After the first round of single-origin chocolates, we were given three more chocolates, this time not pure chocolates but treats with fillings and other flavorings, more representative of the bulk of the chocolates they sell in the boutique. Currently the chocolate tasting are only arranged for private groups, but in the future M. Cluziel hopes to offer tasting classes that are open to anyone who would like to sign-up. I would definitely recommend going to a chocolate tasting once in your life. It’s a unique experience and as chocolate is something that touches all of our lives (I hope), it is interesting to learn about the journey between the tree and your mouth. I’m not sure, however, that you need to go multiple times, as I would with wine tastings, or even twice. But that’s the opinion of someone who still prefers Snickers bars over all this fancy stuff. I’d love to know what you think! 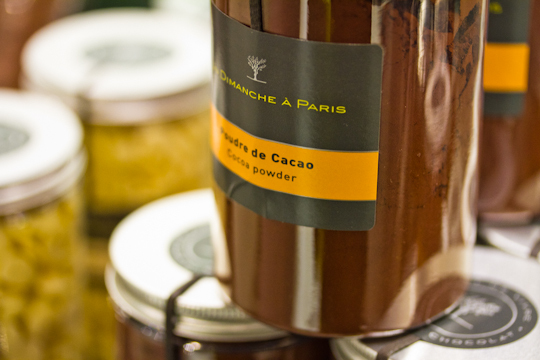 While I may not sign up for a second chocolate tasting anytime soon, I will most definitely be going back to try the restaurant at Un Dimanche à Paris. And the lounge space is large and yet inviting. It could be the new best spot for drinks in the 6th. I am a huge fan of the multi-use space concept and it’s nice to see that Paris is finally just starting to wake up to this trend. Visit the site for hours of operation. 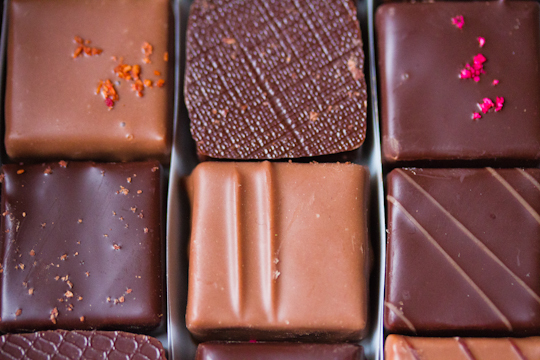 What do you think about chocolate tastings? 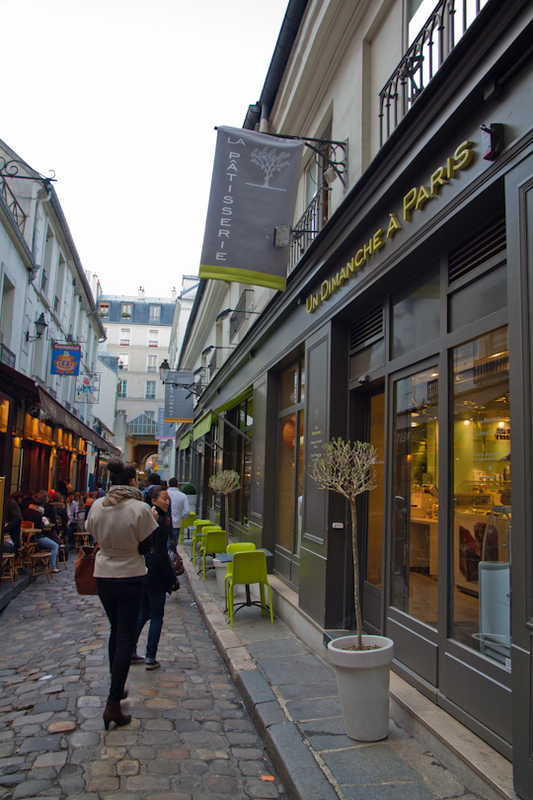 Have you eaten or grabbed drinks at Un Dimanche à Paris? What did you think?